Visit Werner Guitar Editions, my dedicated store for free & premium sheet music, tab, videos, lessons. Instant PDFs, the best security and payment options. Visit Werner Guitar Editions or stay here and browse. Almost all my sheet music selections have free video performances and lessons. I use the RCM Toronto as approximate grades; I change some, so don’t use my grades for exams. Remember, music wasn’t written with grades in mind and pros play pieces from all levels. Classical Guitar Method Vol. 2, Notation, Video Lessons, 89 pages. Classical Guitar Technique: Essential Exercises, Scales, & Arpeggios – Notation, 122 pages, Gr. 1-9. Video lessons, hundreds of exercises. Start after my method books and continue with repertoire. 20 Favorite Exercises, Notation + TAB, Video lessons, Gr.1-6, Great for crossover or a quick boost. Susato: Six Rondes by Tielman Susato. Renaissance, 4 parts, PDF, notation. Recommended editions from other trusted publishers, links to Amazon & Sheet Music Plus. Pumping Nylon by Scott Tennant – Exercises & workouts, memorable and popular. This book is great for students who want to dive into real technique practice for the first time. It’s by no means comprehensive but it’s manageable, I used to play cover to cover almost daily. Kind of a ‘favorite’ exercises book. Pumping Nylon in TAB by Scott Tennant – You tab junkie! The Bible of Classical Guitar Technique by Käppel – 245 pages of exercises and excellent text advice, photos, explanations, and tons of exercises. Maybe too much content for some people? I find it difficult to use but I can’t ignore that it is one of the most comprehensive books today. Classical Guitar Technique (Part1) by Stanley Yates – Text heavy but lots of great info. Halfway between a method on how to play technique as well as many exercises. For those who want tons of information. Classical Guitar Technique (Part2) by Stanley Yates – as above but continued. Sight Reading for the Classical Guitar, Level I-III, and Level IV-V – Form, phrasing, dynamics, and reading skills. These are sight reading books more than they are method books so don’t expect as much explanation. I use these with my students. The Shearer Method (Shearer/Kikta/Hirsh) – See my full article on all four books. Book 1 – Foundations / 2 – Developments / 3 – Learning the Fingerboard / 4 – Harmony. This is the most comprehensive method series currently available for beginner to intermediate classical guitar. The books give you a combined 830 pages of advice, theory, exercises, repertoire, and more. Shearer Classical Guitar Technique, Vol.1 – Good for beginners, lots of info and easy sight-reading. This an old book but it’s been updated by Kikta. It good! Scale Pattern Studies by Aaron Shearer – Very comprehensive, scales & sight reading. Slightly numbing but does the job better than any other book. Kitharologus: The Path to Virtuosity – Difficult but very good. Not for the faint-hearted. Starts from the beginning but gets outrageously difficult. The Segovia Scales by Thrower [read my review]– You tab junkie! Giuliani’s complete studies and exercises – Studies but also his exercises and 120 arpeggios. Iznaola on Practicing: A Manual for Students – Small, concise, technical, how to practice well. A Tutor for the Renaissance Lute (Poulton) – Reading Renaissance lute tablature, techniques, and performance practices. This is a lute book not guitar (for advanced players). The Techniques of Guitar Playing by Seth F. Josel & Ming Tsao – Modern and historical guitar techniques geared toward composers. For advanced students interested in contemporary music. Read my Full Review. Frank Koonce Anthologies – Multiple Volumes, lots of great works, high quality editor. Noad Guitar Anthologies – Multiple Volumes, an excellent start to anyone’s library. Easy Classics for Guitar (Nadal) – Intermediate, has some good stuff. Guitar Music of Spain Vol. 1 by Calatayud – Spanish style, Easy to Intermediate, nice collection. Play Flamenco Guitar with Juan Martin (Notes + TAB) – Fun and gets right to repertoire! Fingerpicking Irish Songs – Some of these are pretty good, has melody above. Fingerpicking Jazz Standards (Notes + TAB) – some good. Piazzolla: Tango Suite, Modern, Tango, Advanced, Love it! Recommended editions from other trusted publishers, links go to Amazon & Sheet Music Plus. Grade levels are simply Easy (E), Intermediate (I), Advanced (A) or combos for multiple levels such as Intermediate-to-Advanced = I-A. Classical Guitar of Bach with TAB – (I-A) You TAB junkie you! 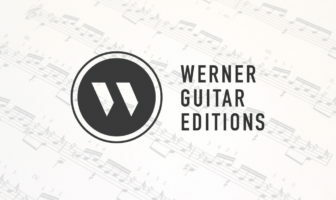 Recommended editions from Werner Guitar Editions AND professional editors, publishers, and guitarists around the world with links to free sources, Amazon, Sheet Music Plus, or other trusted online stores. This area is being updated, check back often! These scores are either over 50 years old or have been released under a public domain or creative commons license. I’ll try to only post the good ones but be warned as to quality.